Please note: Scholarship applications close at midnight on 6 July, each year. However, if you have already confirmed your audition-slot by 6 July – even if the appointment falls later in July – you will still be eligible for consideration! The Giles Foreman Centre for Acting is delighted to announce the return of the annual scholarship, offering one actor or actor/director a subsidised place on the 16-month advanced Professional Intensive Acting & (Post-Graduate-equivalent) Acting/Directing Programme, and training from some of the world’s leading acting coaches. Actors and actor/directors are invited to submit a one-minute long video audition piece by midnight on 6 July, along with a completed application form. 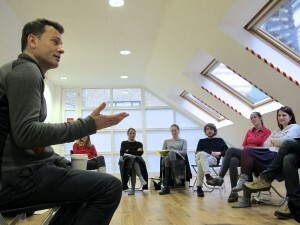 A shortlist (maximum of 10) are invited to an audition-day in London with Giles Foreman and other core tutors. At this point, an additional letter of application is required, where you may set out reasons for applying for the award. If you are chosen, you will earn a scholarship granting you a place on the postgraduate course with some of the finest acting training available, for 50% of the standard fee. The award is currently worth £5,750. The Giles Foreman Centre for Acting is a privately-run studio based in the heart of Soho in London, with another Centre in Paris, and regular workshops in NYC and other European cities. The studio actively seeks to open up its training to all, and despite being a self-funded institution, continues to explore ways to reach out to talent irrespective of the financial or social background. The Centre was set up by Giles Foreman, one of the foremost acting coaches, who taught for many years at Drama Centre London, where many of today’s leading actors trained; such as Michael Fassbender, Tom Hardy, Tara Fitzgerald, Ruta Gedmintas (Che, Heroes) and Santiago Cabreras (Borgias), Gwendoline Christie, John Simm. Giles is supported by Christopher Fettes, one of the founders of Drama Centre who has trained actors including Colin Firth, Sean Connery, Simon Callow, and Sir Anthony Hopkins. We are also registered with the Professional Career Development Loan scheme. The acting philosophy of the Giles Foreman Centre for Acting has grown from that of the original Drama Centre London under Christopher Fettes, Yat Malmgren and Reuven Adiv: a teaching team and school that trained some of the great UK actors of our generation – Sean Connery, Anthony Hopkins, Colin Firth, Pierce Brosnan, Helen McRory, Anne Marie Duff, Paul Bettany, Lambert Wilson, Michael Fassbender, Tom Hardy, Santiago Cabrera, Geraldine James, Frances de la Tour – to name but a few. Christopher Fettes offers master-classes in directing and classical text analysis at the studio. • Video a monologue / extract of no more than 1 minute in length and email a link with the subject line ‘Giles Foreman Centre for Acting Scholarship Submission’. Due to the file-size, we require those submitting to send video files via Wetransfer or other free downloading sites, or to upload via YouTube / Vimeo (videos can be set to private on both). Actor/ directors should also provide a statement about their specific experience in these fields. • Complete an application-form – available for download here. The completed form may be returned via email or post. • Videos will not be judged on production quality, but please ensure that the audio-visual quality is good enough to be appropriately assessed. • Those shortlisted will be given at least 2 weeks confirmation of the audition-date in London. • A decision will be made on the scholarship no later than 1 August, with the successful candidate invited to enrol in September for the next cohort. • Anyone who has been auditioned does not need to supply a video, but must send a confirmation email by the deadline, stating their reasons for wishing to be considered.